Velvet was invited to the Gala Opening of Christie’s first auction in Shanghai on September 24th, 2013. Christie’s inaugural Shanghai sale is a celebration of the great artistic traditions of both East and West. This curated sale includes exceptional works in many collecting fields – from Asian Contemporary to European Modern Masters and American Post War and Contemporary, from jewelry and watches to wine and decorative arts. Christie’s has become the first international fine art auction company to be granted a license to operate independently in Mainland China. During the first auction on September 26th, a modest affair by international standards that brought $24.9 million for 39 paintings, sculpture, jewelry, watches, and wine. Following the break shortly, we held a lucky draw and we would like to personally thank MaryH for her beautiful leather handmade wallets as prizes. The lucky winners of the draw were Dominique Simard (Director of Fashion Education at Conde Nast), Rodolph Garnier (China Global Sourcing Director at Camaieu) and one of our speakers, Svante Jerling (Founding Member and VP of P1.cn)! Alexis Bonhomme navigated us through the new WeChat App 5.0 Version, showcasing powerful new tools that are beneficial to both businesses and consumers. Everybody upgrade to 5.0 now! See the article to know more about the new WeChat 5.0 features. Michael Shi is the founder and CEO of Hairbobo, the B2B community website bringing hairdressers and stylists together to share tips and the latest trends in hair and fashion. He also introduced their new app for consumers, which features an online booking function to book for hair appointments with hairdressers and stylists. Svante Jerling unveiled the exclusive activities behind P1, its new projects, as well as its luxury members. P1 is a platform that showcases the latest street styles of fashionistas in China. Mimi Vong presented the different consumer profiles YOOX has in Asia and the strategies that made YOOX so powerful today. Yoox is diversified in its profile: yoox.com, thecorner.com, and shoescribe.com. In China, it has launched an exciting collaboration with the Super Boy contest 2013, a famous singing competition in China. During the talk, Mimi offered some valuable advice for brands including their product selection and a focus on younger generation consumers. Following the panel sessions, it was networking and fun time! We loved the French fusion finger food, Polaroid photos, and creative dance by Nunu that filled the night. The event was a big success and Velvet would like to give a big thanks to our active participants, speakers, and entertainers that made this a night to remember. – See more pictures of the event here! The Museum of Contemporary Art Shanghai hosts the Esprit Dior exhibition in China in partnership with the House of Dior. The exhibition tells a story of groundbreaking vision and unique savoir-faire, and showcases contributions by contemporary Chinese artists working in a variety of disciplines with a view to addressing the challenges of our era. More information on House of Dior. If you want to see more pictures of the event, please visit our Facebook page. Glamour Sales – Why mobile is a key for flash sales in China? With substantial discounts and limited quantities, online flash sales of designer goods became an e-commerce staple in the West after the start of the recession. According to Thibault Villet, CEO and co-founder of flash sales site Glamour Sales China, this lightning-fast form of e-commerce has just as much potential in Asian markets. After setting up in Japan in 2009, Glamour Sales Group opened its Chinese site in 2010, and announced a partnership with Neiman Marcus in 2012. Villet recently presented on his company’s business strategy at Velvet Group’s Shanghai Fashion Web conference, which brought together industry professionals to discuss cutting-edge developments in digital marketing and e-commerce. Jing Daily reached out to Villet via email to discuss the unique opportunities and challenges that accompany conducting this distinctive form of e-commerce in China, including the specific demands of Chinese consumers and the constant need to adapt to rapidly changing technology. Who is your target demographic in terms of age, income, and location? Over the last four years, we have grown a qualified database of over 2.5 million fashionista members in China. They are spread out across 1,000 cities in all provinces, equally split between tier-one, tier-two, and tier-three and four cities. While we predominately target women aged 25 to 45, we also have a robust and fast-growing male customer base. All our customers, being entrepreneurs, executives, or white collars, have in common the characteristics of being smart shoppers, highly interested in fashion, and open-minded to discover new brands. Are there any differences between conducting online flash sales in China as opposed to Europe or the United States? The main difference versus Europe is that Chinese customers are very demanding when it comes to customer service and have been used to very fast delivery services. We deliver our customers across China in one to three days, and accept unconditional returns within seven days. Versus the United States, Chinese customers expect much more detailed informations on brands and products, which requires additional depictions and detailed copywriting. What are some of the main reasons your customers like to participate in flash sales—is it more about the bargain, the “thrill” that comes with buying something in limited quantity before it runs out, or the website’s curation? Customers like to participate to our flash sales because of three factors: the website curation and the guarantee that all the products sold on Glamour Sales are authentic and of great quality, the excitement of the daily race, which on Glamour Sales China starts at 9 a.m., and the opportunity to buy at real bargain prices, which Glamour Sales does as we exclusively cooperate directly with brands or their official distributors, hence guaranteeing the best prices on the market. What are some of the greatest challenges to conducting e-commerce in China at the moment? The market is growing fast and customers are expecting high-quality customer services, which starts from website speed to call center abilities to handle customer care. While we grow, offering a consistent and qualitative customer experience is our daily company focus. Technology is also evolving rapidly, and we have to continuously transform ourselves. We already run four platforms, including three mobile ones, and will release a new version of the website before the end of the year. How many customers purchase via mobile device as opposed to on a computer at the moment? Do you see this changing in the future? We prepared ourselves for the rapid shift from desktop to mobile, as our sister company in Japan had already experienced it two years ago. Mobile commerce in China is now the fastest growing channel, and already represents a significant share of our business. It forces companies like ourselves to develop contents which are adapted first to mobile, and that will then be used on desktops. How does your company utilize social media marketing? Social media marketing is a the center of our marketing strategy in China. 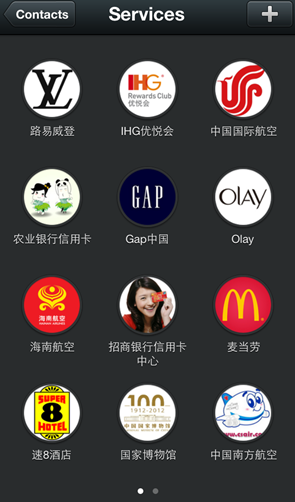 Our customers follow us on various platforms (Weibo, WeChat, etc. ); we have built strong and long-lasting relationships with social media key opinion leaders as well as key platforms such as Mogujie. We also fully engage our own customer care teams in a personalized social relationship with our members and customers. What is the status of Glamour Sales’ partnership with Neiman Marcus at the moment? Will there be any changes to the partnership now that the company is being sold? Neiman Marcus is and remains a strategic investor in Glamour Sales Holdings, and we are very pleased with this partnership. – See more here on Jingdaily website. Although instant messaging tools are most commonly used by individuals for personal communication (C-to-C), WeChat, a leading Chinese IM app, gradually established its presence as a major channel of online marketing (B-to-C). The newly launched 5.0 gives special focus to business users by adding a list of new features that caters for the business demands. Alexis Bonhomme, the general manager at Curiosity China, a WeChat integrated agency focuses on foreign premium brands promotion, shared with us his experiences of running marketing campaign on WeChat platform at Shanghai Fashion Web recently held by digital consulting agency Velvet Group. There are two kinds of business accounts, the service accounts and the official accounts. Both of them integrated navigation menus in the interface to include richer contents. Service accounts allow brands to send messages directly to the personal chat windows of each consumer, which guaranteed high visibility and opening rate. Contrary to online marketing on Weibo, where companies can push ads at a high frequency, service accounts can send around one push marketing message per month. This restriction not only protects users from spams but also encourage brands to be more creative in compiling ads. The main idea is to provide high-quality content experience and increase the activity rate on the WeChat brand account. This kind of one-to-one communication is especially suitable for the promotion of premium brands or high-tier services, because it guaranteed the senses of “exclusivity” and “intimacy”. The official accounts of Wechat 5.0 are basically consistent with the 4.0 version in terms of functions. Official accounts cannot send ads to individual chat windows like service accounts, but it allows higher ad pushing frequency of one message per day. However, this mechanism leads to risks that users may “unfollow” the account to avert ad harassment. Official accounts will be more useful for mass-market brands that aim at maximum followers. 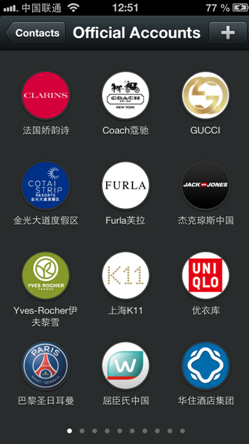 With the newly added payment function, WeChat users can purchase products from e-commerce platforms, such as BuyQQ, Amazon, Yihaodian, or Dangdang, via their credit cards bundled to WeChat accounts. Users will be directed to the platforms that sell their desired products by scanning the QR codes. Both of the abovementioned accounts feature more CRM technical tools like listing all the stores of a certain brand and help users to pinpoint the nearest outlet or find sales promotion based on LBS. Moreover, this feature will help the promotion of brands so as to increase the traffic of new or less-known outlets. WeChat also kicked off several technical developments for the new version. The LBS function will provide a better online to offline user experience. For example, if a Guangdong-based customer is shopping in a Beijing store of certain brand that he or she is a member, we can imagine in the future that the system will suggest the shopping guide to talk to the customer in Cantonese. When companies post ads on different advertising channels, such as various fashion magazines or websites, there will be tiny differences in the QR bars printed on them. In the back-end system, the companies will know which customer is from which channel, a valuable data to support the compilation of future marketing strategies. Last but not least, WeChat starts to be seen as a R.O.I calculator and is used to increase the efficiency of the marketing spending. – See more here on Technode website.